Stress causes many adverse reactions in the body. From increased blood pressure to fatigue, sleep problems, pain and many more. Stress causes inflammation in the body and inflammation is at the core of most diseases that affect the human body. We will give you examples of foods for stress but we will break them down to each category of macro-nutrients to make it easy to see good foods compared to bad. There are two categories of nutrients: macro-nutrients and micro-nutrients. Macro-nutrients are broken down into four categories; carbohydrates, protein, fats, and fiber. Micro-nutrients are things such as vitamins and minerals. It is important for us to know how these nutrients are used in our bodies and the best sources to get them in our diet. The more you know, the healthier you can grow! So on we go to explore good foods for stress. HIGHLIGHT-50% of your daily caloric intake should be from foods in this group on days you work out, 30% of calories on days you don‘t. Carbohydrates are important for another reason that we touched on earlier. When you lose weight you don’t just lose fat, but muscle tissue as well. When the body is deprived of calories from fat for energy it will take muscle tissue and burn it instead in a process called gluconeogenesis (big word for getting glucose from alternate sources). Eating enough carbohydrates keeps a good energy source in the body if you are depriving it of fat. This energy source will then spare muscle tissue from being used as an energy source and you get to keep the muscle and burn the fat. The good news is not only does keeping more muscle make you look great, but it also is a highly metabolic tissue, meaning that it requires lots of energy to keep it going. It will then get part of that energy from the burning of fat! So keeping more muscle makes you lose fat faster! Remember to cycle your carbohydrate intake. 60% of calories on days you exercise, 30% on days you don’t. To help keep track of your intake, one gram of carbohydrates will yield four calories in the body. This is a macro-nutrient that will pump you up! Proteins are the building blocks from which most of the tissues that make up your body are made. The one most associated with protein is muscle tissue. It is important to have plenty of protein in the diet to keep muscle tissue happy, but it is also important for skin, hair, nails, the stomach, hormone production, and DNA replication. So protein is one of the great foods for stress. The problem is that many times protein rich foods can be high in saturated fat and cholesterol. Most animal products fall into this category unless the effort is made to remove fat from the meat before it is served. Meat must be cooked to insure that any harmful bacteria are destroyed before it is eaten. Cooking is a form of processing that makes the protein less bio-available. So be careful not to overcook or char your protein. This is also important because if you cook animal fat, it causes the fat to convert to trans-fatty acids which are carcinogenic or cancer causing. These are some of the reasons I prefer to get my protein primarily from vegetable and grain sources. 30% of the calories that you ingest should be from this group on days you exercise. This can increase to 50% on days that you don’t exercise to assist in recovery from your workout the day before. For your information, one gram of protein will yield four calories in the body. Excess protein consumed above the amount needed to build new muscle can be dangerous as studies have linked this type of diet to making the blood more acidic than normal which leads to osteoporosis and kidney stones. Fat is actually a very important food for stress. The body has many needs for fat. One is for long term energy as we have previously discussed. Another is for healthy brain function. In fact, the brain is made up mostly of fat. Fat is also important for cell membrane formation and hormone production, to insulate and protect your vital organs and transport fat soluble vitamins A, D, E, and K. The problem with fat is that we tend to consume too much and the wrong type in the typical American diet. The reason for this is fatty food tastes good. We have been programmed from the beginning of humanity to enjoy the taste of fat because it is important. It was great to consume a fatty meal for long term energy storage when we didn’t know what time or even what day we would have our next meal. Obviously, most people in this country do not have to worry about that any longer, so fat consumption should be limited. Most health experts recommend only 10-20% of daily calories to come from fat. There are healthy fats and unhealthy fats. Animal fat is high in the saturated variety which means that it not only sticks to your ribs, but to your artery walls in the form of plaque. This is one of the main contributors to heart disease. This is why I recommend only lean cuts of meat and only once in a while. I do recommend that you eat fats from different sources throughout the week, such as plant and fish oil, to balance the amount of omega-3 and omega-6 in your diet. These fats actually help boost the good cholesterol in your blood and are healthy for your arteries and heart. Also, there are blended oils available in most health food stores such as Udo’s© Perfect Blend Oil. They are in the refrigerated section and should be stored in the fridge at home to keep the oil fresh. Remember that when you cook fats, if they are cooked for long periods or over excessive heat, they can be converted to trans-fatty acids which are carcinogenic. That is why I recommend that you use just a very small amount of oil when you cook and add more if you like when cooking is complete or in the last few minutes of cook time. Here are some examples of good and bad fats. Fats should constitute no more than 20% of daily caloric intake. One gram of fat yields nine calories in the body. 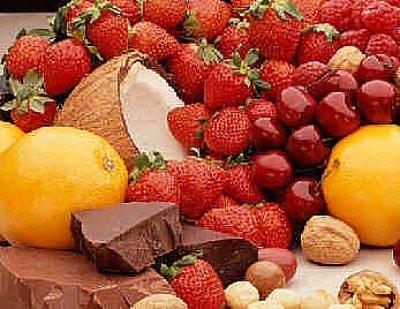 The best foods for stress are whole fruits and vegetables. Raw is the best way to consume these foods as not to lose any of the healthy vitamins, minerals, and enzymes that can be lost in cooking. I like to eat 6-10 servings per day of fruits and vegetables. An easy way to get more of these foods is to have at least one salad per day and include greens, other colored vegetables such as peppers and squash, add some fruit such as avocado or apples, and top it off with nuts or fish for protein. Then you can use balsamic vinegar and extra virgin olive oil for dressing to get your dose of healthy fat. Another way to enjoy fruits and vegetables is to have a shake made in the blender. Combine any combination you like and add some water and honey to taste. One of my favorites is to add greens, peppers, avacado, apples, carrots, celery and pineapple with some water and honey. Experiment and find what combinations you like best. This is fast food you can really live with! Yes you can eat chocolate and get some major health benefits! The main thing to remember is that the darker the chocolate the better. Dark chocolate contains powerful antioxidants to help fight free radical formation in the body. Foods for stress are foods that fight its effects in the body. If you are consuming too many foods on the bad lists then they will contribute to more stress in your life. Try to stick with the good list foods and lots of raw fruits and vegetables so that stress will have less of an effect on you!